The lowest energy geometry is shown above. Conspicuously, it does not form an intramolecular O-H…O hydrogen bond, but adopts a C2-symmetric form. NBO analysis for this geometry reveals two interactions larger than the rest. 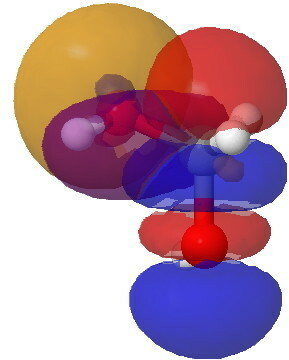 The first, shown below, involves overlap of an oxygen lone pair (Lp) donor orbital with a C-H acceptor (purple+blue, orange-red), and this is worth E(2) 6.1 kcal/mol (there are two of these). Unfortunately, the analogous NBO interaction in acetone itself originating from a C-Me bond as acceptor is 6.3 kcal/mol and so this interaction does not differentiate between the two. The larger NBO interaction of E(2) = 16.9 kcal/mol arises from the same donor orbital interacting with the C-O acceptor (the presence of the more electronegative oxygen accounts for it being the better acceptor). In acetone however, this too has the high value of 16.8 kcal/mol. NBO interaction between Oxygen Lp and C-O acceptor. Click for 3D. Another possible interaction might be from a H-C donor to a C-O acceptor. But as you can see below, the positive overlap (red+orange) is matched by the negative overlap (orange+blue) and this interaction turns out to be insignificant. We have to seek elsewhere for differentiation between formaldehyde and acetone. To do this, I have added four explicit water molecules as solvent, and looked at the free energies of diol formation from the carbonyl (wB97XD/6-311G(d,p)/scrf=water). 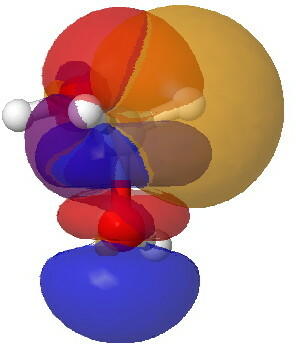 Methanediol with four water molecules. Click for 3D. 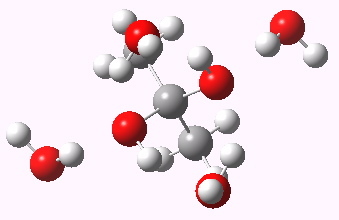 Propanediol with four water molecules. 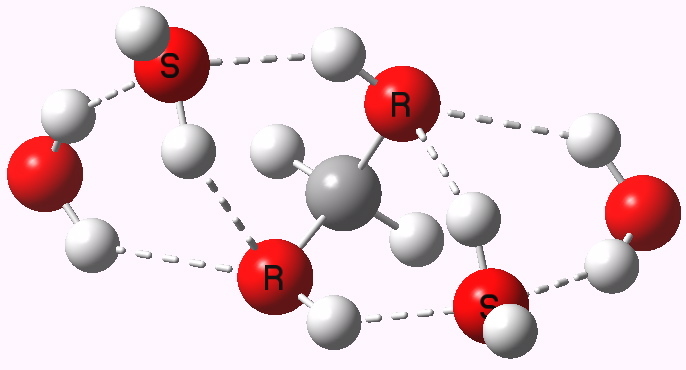 The water molecules combine with the methanediol to form an elegant lattice of hydrogen bonds, involving two rings of three oxygens and one ring of four oxygens. This compact motif is less stable for propanediol, which instead prefers a structure forming fewer hydrogen bonds, largely because of the presence of the hydrophobic methyl groups. The result is that the free energy of hydration of formaldehyde to the diol, assisted by hydrogen bonds formed to four water molecules, is exothermic at -1.2 kcal/mol, whereas that for acetone is endothermic at +7.5 kcal/mol. As with most things water, a proper stochastic exploration of all the possible configurations of the hydrogen bonds is necessary for a definitive explanation. But it does seem that a probable theory for why formaldehyde readily forms a diol whereas acetone does not lies not so much in stereoelectronic donor-acceptor interactions but in the hydrogen bonds set up in the solvated diol. This entry was posted on Monday, March 12th, 2012 at 7:39 am and is filed under Interesting chemistry. You can follow any responses to this entry through the RSS 2.0 feed. You can leave a response, or trackback from your own site. Thanks for another insightful post. The important contributions of the hydration of the product is convincing. This could also answer, why formaldehyde is hydrated to >99.9% in solution (see comment below), but still it is impossible to isolate the hydrate CH2(OH)2 in pure form (evaporation produces CH2O + H2O). The stability of the hydrate is connected to the hydration shell! It is possible that the actual content of fromaldehyde hydrate is somewhat lower than calculated at high formaldehyde concentration; not because of free carbonyl content, but due to oligomer formation (polyoxymethylene). However, I don’t think the 80% number mentioned in Wikipedia is correct. The number is certainly not from the Anslyn/Doubherty book cited for K(hydr). This is extremely helpful as i’ve been conducting some experiments to look at the “crossling linking” effect on globular peptide polymers and monomeric peptides using some mass spec devices and have spent many an hour arguing with colleagues over this topic. 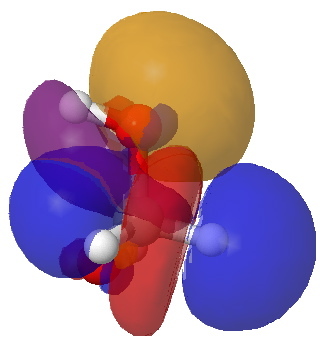 I can see where wiki got the 80% as when working out the theoretical kinetic equilibriums between HCHO and HCH(OH)2, taking HCHO as ~3pKa and water as ~7, we get a KEq of 0.8 assuming that the product being HCH(OH)2 has a pKa of 5. Now takiing these 2 estimated PKa’s of HCHO being 3 and HCH(OH)2 as 5 and for the purpose of this we’ll just look at lysine sidechain with 10.5 Pka, theoreticallly the condensation reactions are HCHO + Lys with a 1.11 Keq while HCH(OH)2 + Lys is 0.71Keq, sugesting that dehydrated form may be required for this reaction to take place This is only for the first part of the reaction as this will then need to stabilise wiith another amine, imine or aromatic ring (mannich reaction) forming a 2 covalent bond bridge either within the same peptide or from another peptide in close proximity, again the carbon atom from the second reaction may or may not need to be hydrated, or even dehydrated if H2O is not liberated from the first reaction. Jason, the pKa are irrelevant, because at neutral pH none of the species present in aqueous formaldehyde is ionized to any particular degree. In fact, the measured pKa of CH2(OH)2 is 13.3, which is somewhat lower than a typical alcohol, as expected by the sigma acceptor effect excerted by the second OH group. In the meantime I found out where the 80% are coming from: indeed, in aqueous solutions of formaldehyde, there is an oligomerization equilibrium between CH2(OH)2 and HO-(CH2-O)n-H with n = 2, 3, 4, 5, and so on. In a 3% solution of formaldehyde in water, there is 84.5% monomer (methylene glycol), 14.5% dimer, and 1% trimer. 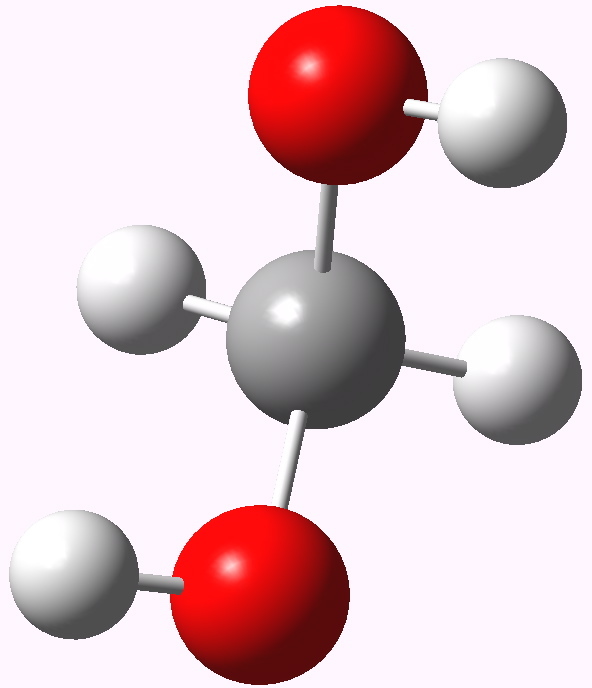 Note that the concentration of non-hydrated formaldehyde is too small to measure, as expected from K(hydrat) = 2200.